Stronger, more advanced hitters didn’t prefer how light it was and complained a few times about hand sting. All the players under 10 loved the light swing of the USA Bat. It also had a great sound, feel on impact as well as the design. The USSSA and BBCOR versions of this bat are the next g… Jump to the full review. We aren’t the only ones to have information about the Threat. Other places, in particular those who sell bats, usually have a boiler plate write up on the specs of a bat. Many of those we reference to make sure we are seeing what we should be. Here are some more references for the 2019 Rawlings Threat review. Stronger, more advanced hitters didn’t prefer how light it was and complained a few times about hand sting. All the players under 10 loved the light swing of the USA Bat. It also had a great sound, feel on impact as well as the design. The USSSA and BBCOR versions of this bat are the next generation Rawlings Prodigy. The Prodigy is a single piece aluminum bat with a low price point and a low swing weight. 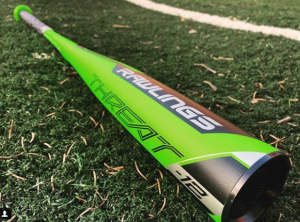 The USSSA Threat and the BBCOR Threat are, essentially, remakes of the 2018 Rawlings Prodigy. That bat is a single piece aluminum built with some technology in the aluminum that allows for a longer sweet spot. These bats are nothing to write home about as there are several dozen slightly inexpensive single piece aluminum bats on the market today. The USA Threat, on the other hand, is an ultra light swinging single piece composite that, at least in 2018, filled a void that very few bats did: light swing, good price point. The BBCOR Threat is a straight forward single piece aluminum bat. This bat is made from aerospace-grade aluminum like almost all other simple, inexpensive full aluminum bats. There is nothing here to be excited about, but it is a bat, made by Rawlings. Younger Little League players, or those required to swing USA Bats, that also don’t want to spend a fortune, but enough to get something legit, should really like the Rawlings Threat. Assuming, of course, they aren’t seeing serious pitch speed (60mph+) or maintain high end bat speed. Major collisions with this bat off the sweet spot will hurt, a lot. We’d also recommend the bat for the drop 10 player who is kept in short sizes (like a 29) who might benefit from adding an inch or two to their reach. Expect the lightest swing you could imagine and that is about what the Threat feels like. The Rawlings Threat in USSSA/Big Barrel has a good sized barrel and feels good on slower pitch speeds. But, don’t expect too much here. The bat is as simple as they get. For some (maybe even many) who don’t play too many games and would like their own trusty bat this might do the trick. In terms of a great feel and top end performance you should look elsewhere. There was officially no Threat in USSSA and USA last year. However, there is was a Prodigy and this bat takes its place in a long line of simple, single piece aluminum bats from Rawlings. The Threat in USA is considered by some a 2018 and by others a 2019 bat. It came out later in the season for 2018 because there was a huge need for a light swinging USA Bat. This, in a drop 12, did the trick. The Beast X Hyperlite from Easton is a drop 12 in the USA Space. However, that version of the drop 12 is a 2 1/4 barrel bat. We think a 2 1/4 bat is a terrible idea in the USA space. The Hyperlite does have a 2 5/8 version in a drop 11. But, if you were looking for a drop 11 you’d likely not have made it this far in an article about the drop 12 Threat. There are enough early reports on the Beast X Hyperlite to prove it is not going to be the favorite in this years 2018 USA Bat space. If your intent is to get the lightest swing you can possibly find then the Rawlings Threat should be your choice. The USA Rawlings threat is a single piece composite bat with an ultra light drop 12 swing. The barrel size measures out below average when compared to other drop 10s in the space, but they are far from the smallest. And it stands alone in the 2 5/8 drop 12 space. It also comes in as short a size as a drop 28 inch drop 12. That is, you can get a at that weighs close to 16 ounces—making it appropriate for players as young as 6 years old. Note, as well, our 31/19 weighed in closer to 18 ounces. And the swing weight on the bat (with a real focus of the weight in the handle not the barrel) push it well below other 18 ounce bats on the market. In fact, its swing weight was even lighter than the 27/17 Marucci F5. Our swing weight measurements suggested the Threat more appropriately categorized as a drop 13–and, as such, the lightest USA Bat on the market. We recommend the bat to younger players who are looking for as much bat speed and control as possible. Below lies our entire 2018 Rawlings Threat USA Bat Review.